Come ashore at Starboard Anchor, a fantastic 7-bedroom home right on the oceanfront. This spacious house has room for everyone and plenty of entertainment opportunities to keep your whole family occupied. Enjoy awesome ocean views from all levels and a sound view from the second and third levels. The cargo lift to all levels will make your arrival a breeze. Shoot some pool in the first floor game room, or just kick back on the couch to watch a good movie on the TV with DVD player. A wet bar with microwave and full-size refrigerator is perfect for movie snacks or poolside treats. Step out the slider door and walk down onto the pool deck for a splash or enjoy some time in the hot tub on the shaded deck. 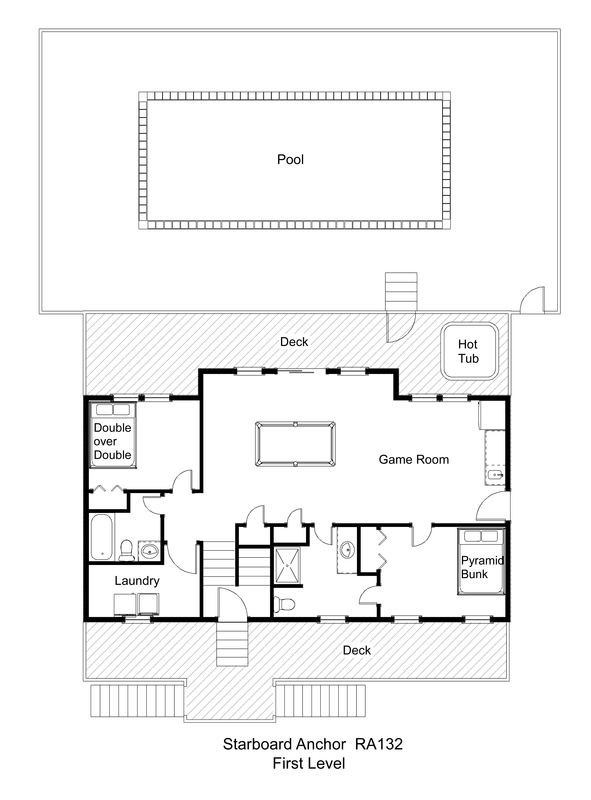 There are two bedrooms on the first level, each with TV. One has a double over double bunk set. The other has a pyramid bunk set with trundle and opens onto a semi-private bath with shower stall shared with the game room. Another full bathroom is on this level, as well as the laundry area. Doze off to the sound of the waves crashing on the beach in any of the 4 bedrooms on the second level. A king master bedroom with TV and DVD player opens onto a shaded oceanfront deck. 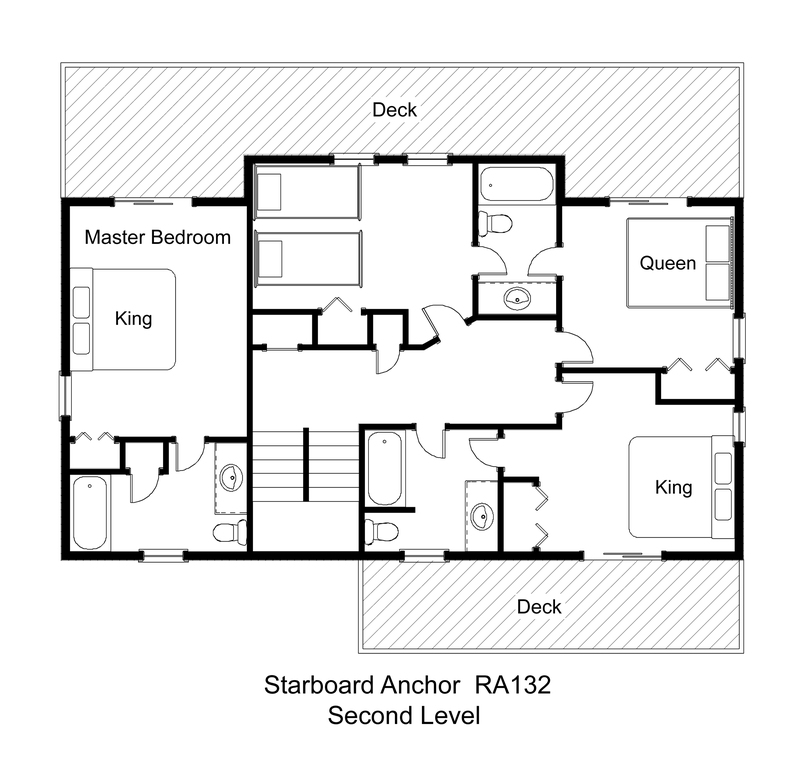 A bedroom with 2 single beds shares a Jack-and-Jill bathroom with a queen bedroom with TV and DVD player, which features another slider to the deck. Across the hall, a king bedroom with TV and DVD player boasts a private soundview deck and shares a bathroom that opens onto the hallway. Gather together upstairs in the open kitchen, dining, and living area. The well-equipped kitchen with sound views is just the place to whip up something tasty your whole crew will love. With a breakfast bar and a side table in addition to the main dining table, there is plenty of space for everyone to dig in. During the off-season, curl up with a good book in front of the electric fireplace in the living room with TV and DVD player. Step out onto the oceanfront sundeck for breathtaking sunrise views. 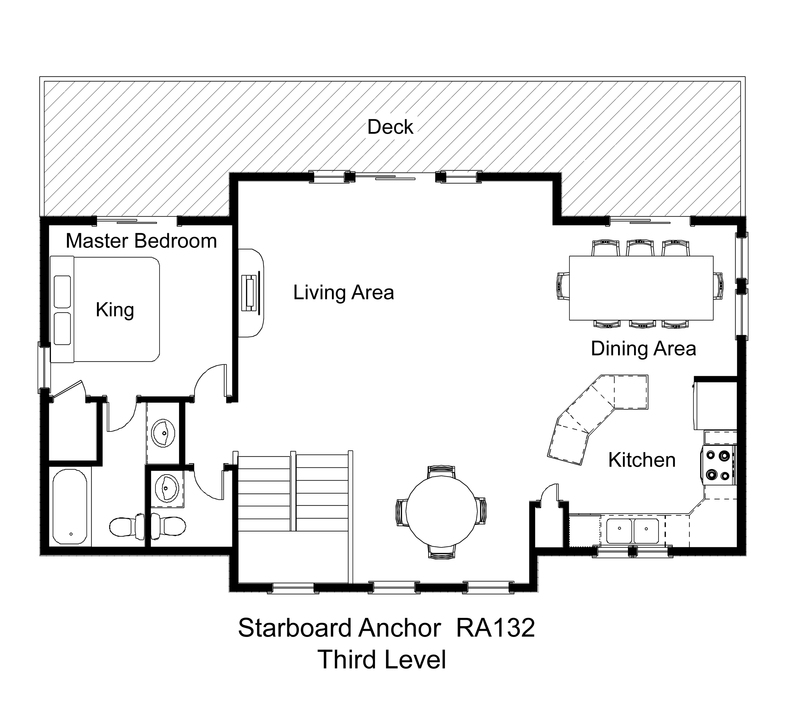 A king master bedroom with TV and DVD player also opens onto the sundeck. A half bathroom completes this level. You’re just steps from the beach when you stay in this wonderful home, and as a guest in the Mirlo Beach subdivision, you have access to community tennis courts as well as a sound access just right for launching your watersports equipment. Set sail for Starboard Anchor and get ready for the vacation of a lifetime! Pool heat is not available for this home. We love everything about Starboard Anchor. We have vacationed in this home for the past 8 years and hope to have many more to come!! Great for large families- great location for easy beach access - beautifully redecorated ! Pool was very very nice. very convenient to beach with great ocean views from the upper deck. Comfortable and well maintained. The recent updates to deck furniture, flooring, furniture and bedding were all welcome additions to an already wonderful vacation home. Looking forward to our fifth stay next year.